Inside: Saving for retirement is a start, but find out why investing may be the only way to have enough money to retire comfortably, or even at all. You are saving regularly and even have it all automated. Yay! But when it comes to planning for your post-work life, saving for retirement isn’t enough. You need to invest. Take heart. If you aren’t already investing, you aren’t alone. Before the crash in 2008, almost 65% of adults were investing. The crash was scary and frustrating and drove people out of the market. A recent Gallup poll shows that now only about half, or 52%, of Americans invest in the stock market. This includes stock, mutual funds or self-directed retirement plan such as an IRA or 401(k) plan. Those numbers aren’t great. More worrisome is that only 38% of millennials are investing. If you are investing, pat yourself on the back. Why? The only realistic way to save enough money for retirement is through investing. It is no wonder that people question whether millennials will ever be able to retire. Right now in the U.S., men can expect to live to an average age of 76.3 and women to age 81.2. The brutal truth is, if you are working, you need to save for retirement. That is unless you want to be working until the day you die. You will likely need a large sum of money to see you through retirement. And saving that much money without investing is hard to unless you have a very large income. But, if we apply compound interest, magical things happen. Let’s say you have $1000 and get a 10% return. In one year, you have $1100. In two years you have $1210. Why? Because you aren’t taking 10% of $1000, you are now taking 10% of $1100. With this scenario, In 10 years you have $2594 and all without adding anything else to your original investment. Because of compound interest, you can invest less to meet your goals. Let’s take a look at how investing might compare to other forms of saving. Do keep in mind, investing is a long game and sometimes, returns are negative (you lose money). Historically, more years have a positive return than not. To illustrate the power of investing, let’s look at three different people. We have Melanie, who chooses to stuff her money under her mattress and so gets a return of 0%. Then we have Sophie, who has found an online bank that pays 1% APR on money market savings accounts. Finally, we have Isabelle who chooses to invest her retirement savings in the stock market using mutual funds. Each of our characters has decided she wants to have saved 1 million dollars by the time she is 65. In order to get to one million dollars by age 65, each needs to save a certain amount of money each month. How much? 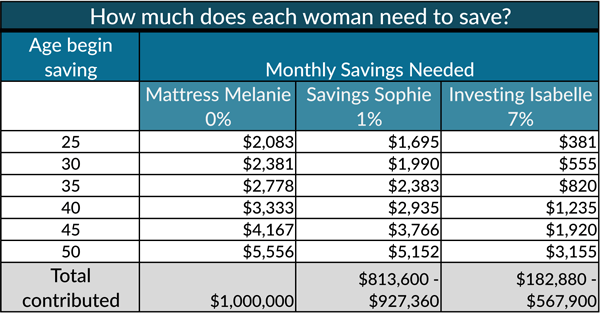 As you can see, even with a high interest (these days) savings account, in order to save $1,000,000 Sophie will need to set aside between $813,600 and $927,360, depending on when she starts saving. Isabelle, however, will only need to set aside anywhere from $182,880 to $567,900, depending on when she starts saving and assuming a 7% annual return. All that extra money Sophie and Melanie contributed to their savings could have been used towards vacations, school, or an even larger retirement cushion. Where did I come up with 7% for investment returns? The historical real return on the S&P 500 (adjusting for inflation and dividend reinvestment) averages around 6-7%. You can see average S&P 500 returns over various time periods here. I like the sound of 6-7% over 0-1% because that compound interest works harder. 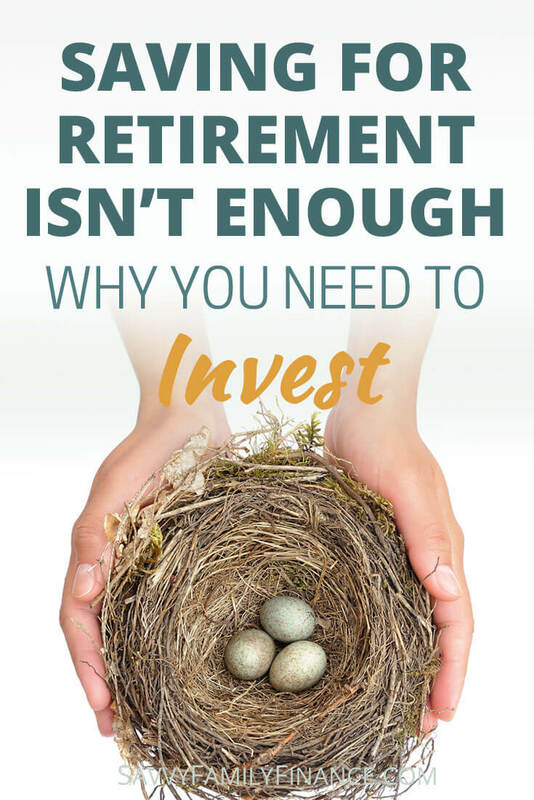 Unless you can stash a lot of money away each month, you can see that just saving for retirement isn’t enough, especially with very little or zero return on your money. There is the caveat that past performance is not a guarantee of future results. The stock market fluctuates and you might put in much more money some years due to a windfall and a bit less others. Having “survived” two nasty market crashes, it can be a bumpy ride and you’ve got to hang on tight. There is some housekeeping you should do before investing. If you aren’t paying your credit cards off in full each month, you need to get rid of that debt first. The interest rates on credit cards can be 15% or higher and getting enough of a real return on investments that beats that isn’t a game you should play. Pay off the debt, then you’ll have money freed up for saving and investing. If you have gotten rid of your credit card debt, the next step is to save up a small emergency fund. Once you get at least a month of expenses saved, and your budget has you continuing contributions to it until you reach 6 months of expenses, then you can start budgeting money for investments. Investments are not the place to keep your emergency fund (or, at least not all of it). Your savings account is actually a great place for an emergency fund as you can readily access the money. Remember, investing is long term, think 10+ or even 15+ years. If your workplace offers a retirement plan, that is a great place to start investing. If you don’t have access to something like a 401(k), there are other options. Even if you don’t have $500 a month let alone $1000 a month for investing, you can start. There are low-cost investing options to get you started and get into the habit of investing automatically. As you’ve seen above, starting small, and starting early can pay off handsomely. Even if you are starting late, you will likely benefit from investing.